The entire economy - including government revenues and thereby the services offered by these governments - depends on wild property speculation. And everyone is praying that it can somehow be maintained. 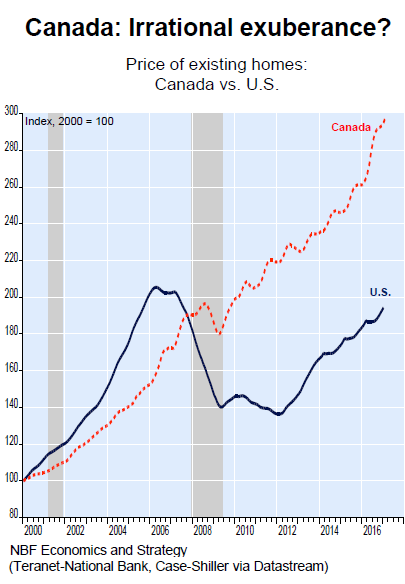 Here's another data point on the Canadian housing bubble, how immense it really is, and how utterly crucial wild housing speculation has become to the Canadian economy. Housing starts surged to 253,720 units in March seasonally adjusted, the highest since September 2007, according to Canada Mortgage & Housing Corp. Of them, 161,000 were multi-family starts of condos and rental units in urban areas. In Toronto, one of the hotbeds of Canada's house price bubble, housing starts jumped by 16,600 units, all of them condos and apartments, defying any expectation of a slowdown. Housing starts are an indication of construction activity, a powerful additive to the local economy with large secondary effects. Housing construction gets fired up by the promise of ever-skyrocketing housing prices, and thus big payoffs for developers, lenders, real estate agents and the entire industry. National home price data covers up the real drama in certain cities, particularly Vancouver and Toronto, but it does show by how much Canadian housing prices have overshot already lofty U.S. housing prices. Home price inflation has become THE hot topic of discussion in Canada. Surging prices are no longer confined to greater Toronto and Vancouver. As today's Hot Chart shows, we estimate that close to 55 per cent of regional markets in Canada are reporting price inflation of at least 10 per cent. This record proportion is very similar to that observed in the United States in 2005 at the peak of the market. When 55 per cent of the market is on fire, the use of interest rates to cool things down is justifiable. The Bank of Canada must change its narrative and abandon its easing bias as soon as this week. He was referring to the Bank of Canada's meeting last Wednesday. 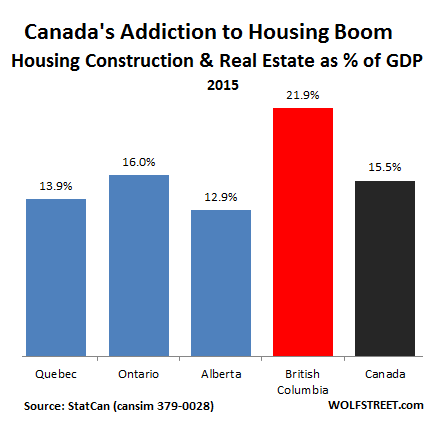 How important is real estate and housing construction to the Canadian economy? Hugely important! It accounts for an ever larger proportion of the Canadian economy. For all of Canada, according to data by Statistics Canada, housing construction and real estate activities combined account for 15.5 per cent of GDP, up from 14.7 per cent in 2011. This is why neither the Bank of Canada nor the governments at the provincial and federal levels are eager to step on the brakes. B.C. tried with its housing transfer tax aimed at foreign non-resident investors. After it was instituted last summer, it temporarily froze up the market, with sellers and buyers too far apart, and transactions plunged. By December, only four months after the transfer tax was implemented, the prospects for 22 per cent of the provincial economy heading into a sharp decline or even a major bust motivated the B.C. government to step back on the accelerator to prolong the speculation -- with an ingenious trick. The province began offering a subsidy to first-time homebuyers: an interest-free loan for a down payment of up to $37,500 to match the buyer's own down payment. It was an effort to allow buyers to get around the down-payment requirements set by the federal government designed to curb wild housing speculation. It seems the B.C. government has figured something out: if anything curbs this housing speculation, on which the province is so dependent, the overall economy is going to tank. Canadian cities are desperately dependent on property taxes for their budgets. Toronto, for example, is facing major budget strains. In February, city councilors approved a 3.3 per cen increase in the residential property tax and they raised the municipal land transfer tax. Under the new budget, property taxes would provide 38 per cent of the revenues, and the land transfer tax seven per cent, for a total of 45 per cent of the C$10.5 billion in tax revenues for this fiscal year. In other words, the city will extract a record C$4.7 billion from property owners to delay falling into a fiscal and financial sinkhole. That kind of tax extraction is bearable for property owners only as long as the value of their property soars year after year. Once that value declines, owning this property becomes a massive liability. This is why the housing bubble and the accompanying crazy housing speculation must be maintained and further inflated, no matter what. It has become an addictive drug for the Canadian economy. Average household indebtedness is among the highest in the world. Many households are carrying little or no debt. But many others are suffocating under a mountain of debt, and a sharp decline in house prices would wreak havoc among them. The entire economy -- including government revenues and thereby the services offered by these governments -- depends on wild property speculation. And everyone is praying that it can somehow be maintained.